These are the best you can get! 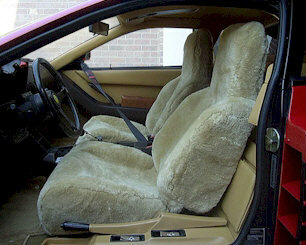 Each Tailor-made sheepskin seat cover is manufactured to the specific YEAR, MAKE & MODEL of your vehicle using plush, 1" thick Australian Merino sheepskins. They're secured to your seat using a durable loop design, elastic strapping system and, as an added touch, each one is finished with a rich looking 1" binding and high grade nickel plated hooks. Our Tailor-made seat cover line will provide you with the best fit, highest quality and longest seat cover life available. Designed to cover the full sides of seat back, full skirt of seat cushion and covers over rear of seat back approximately 8" to 10". This leaves the back of seat open for access to map pockets and provides the best contoured fit on the seat. If your seat has a headrest, this will fit underneath it. Also, if your seats have the side impact airbags built into them or seatbelts integrated into the seats, just let us know and we'll make these to accommodate them. (As you go through the check-out process, you can state this under "comments") Fully cloth lined. See more customer pictures on our Facebook page. 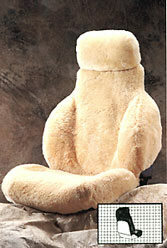 Click here to send an email to us, if you have any questions regarding this style seat cover. Please be aware that we do have patterns available for most seats but we may need to contact you for additional information. Also, these are made to order, so they will take a couple of weeks. Click the "Buy Now" button to enter Make, Model & Year of your vehicle. If you would like to have swatches sent to you, send us an email and let us know which colors you would like to see.